Florianopolis beaches offer everything from secluded and paradise-like getaways that make the Caribbean pale in comparison to nature preserves with long stretches of untouched and undeveloped coastline, upscale beaches with ritzy beachfront estates to rival Ocean Drive in Miami and fun filled beaches packed with young and beautiful people. While the waters at the Floripa beaches on the west side of the island are calm and protected and thus great for families and swimming, Florianopolis' entire east coast is blessed with a constant flow of powerful Atlantic swells, making for some of the most amazing and consistent year-round surfing you will find anywhere in the world. Due to Floripa's unique topography and great variety of breaks, there are likely to be fantastic waves somewhere around the island at virtually any given time. And with so many high-quality breaks to choose from, you'll be sure to always find an uncrowded peak to enjoy wave after wave of uncrowded surf. Two of the best surfing beaches in Floripa , Praia Mole and Galheta, also happen to be two of the most vibrant and beautiful, and are a must see during your visit to Florianopolis. A short ride ride (less than 5 minutes) from Praia Mole you will find 3 more world-class surfing beaches – one for beginners (Barra da Lagoa), one that holds international surfing competitions (Joaquina), and another with over 4 miles of wide open beachfront and isolated peaks (Moçambique). As if that were not enough, don't forget that with a car you will be mobile and can easily reach the best swells other Florianopolis beaches have to offer that particular day at surf spots such as Santinho, Praia Brava, Morro das Pedras and Matadeiro. With your choice of amazing surf all around the island, you will be sure to maximize your surf experience in Brazil. 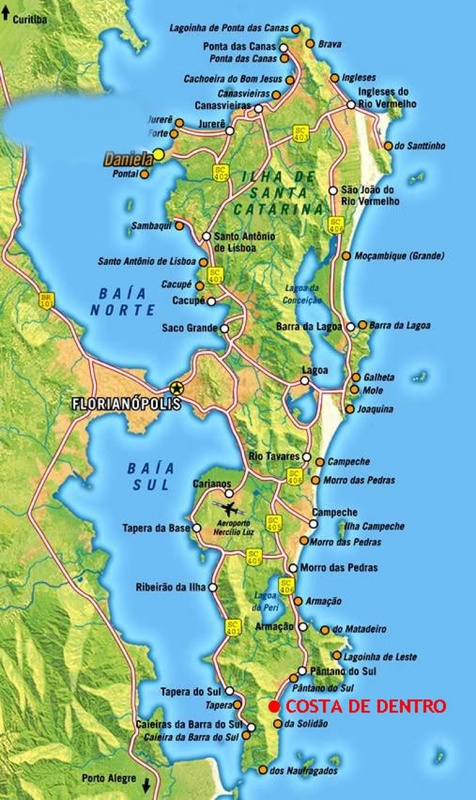 In addition to the incredible beaches in Florianopolis, there are countless more within an hour or so drive along the coast of the Brazilian state of Santa Catarina. These include world famous surf spots such as Praia da Silveira, Praia Rosa, Imbituba (Garopaba), where the finals of Florianopolis’ 2008 WCT event were held, and Guarda do Embaú, known for its powerful left point break and breathtaking natural beauty.